Accordance 11 is now available. Here I offer a full review. To fully understand all I appreciate in Accordance, I offer you this collection of links to my Accordance 10 review posts. While potential upgraders will want to know what is new in 11, those new to Accordance altogether will find a wealth of practical and impressive features. For example, a few initial standouts when I reviewed version 10 were: Analytics (#1 here), Flex Search (first feature noted here), the use of the Command key on Mac to make the Instant Details pane do even more, and Construct searches (see #2 here). 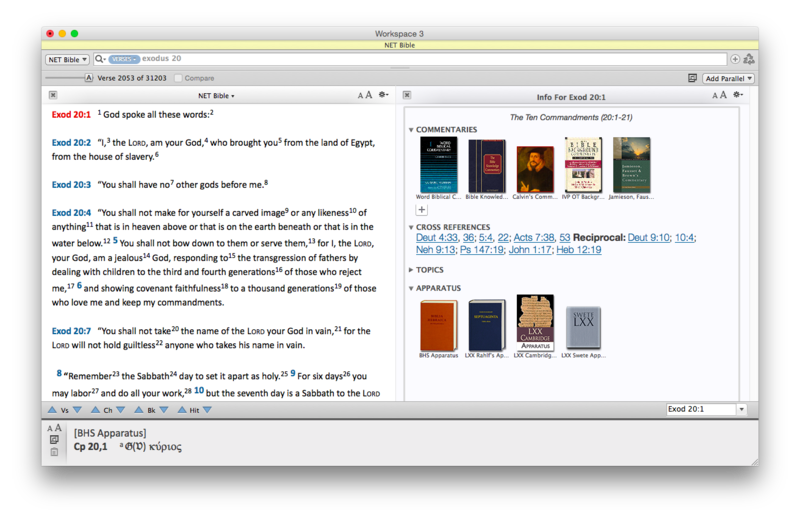 Though you can save a Workspace with dozens of commentaries tied to a Bible text, Info Pane automatically pulls up all the commentaries (and Study Bibles!) you own that treat a given verse. Clicking on the cover image takes you (in a new pane) to that commentary. What’s especially thoughtful about how this feature was programmed is that just hovering the cursor over a cover image shows the text from that commentary in the Instant Details pane. You can also choose from a variety of Cross-Reference modules to display hyperlinked related verses in the Info Pane. The Topics section quickly links you to other verses that address the same themes your passage does. The Apparatus portion is an especially nice feature for doing textual criticism–you can see the information multiple apparatuses contain very quickly. Accordance 11.0.1 already added something neat: you can command-click on your Cross-References in the Info Pane to see them all at once. Whereas in Accordance 10 I had to create and save new Workspaces with relevant commentaries for a given book of the Bible, now in 11 the Info Pane means I can get up and running with research on any book, right away. And the speed with which everything operates from the Info Pane is quite incredible. Long-time Accordance users probably won’t be surprised, but it is good to see that even a more advanced and robust feature like the Info Pane operates with the same expected speed that makes Accordance what it is. New to the online store in Accordance 11 is the chance to “Custom Upgrade,” which provides users with a discounted collection rate if they already own modules contained in that collection. The Custom Upgrade option is recently also available for various Add-on Bundles. This new feature will especially be welcomed by long-time users who will essentially be rewarded now for past purchases, should they decide to upgrade in various instances. When I first heard about this feature, I didn’t think it would be that big of a deal–predictive text entry is already available in Google and a host of other free programs. But Quick Entry really does speed up my work with Accordance. One especially neat thing about this feature is how it works with Bible texts. 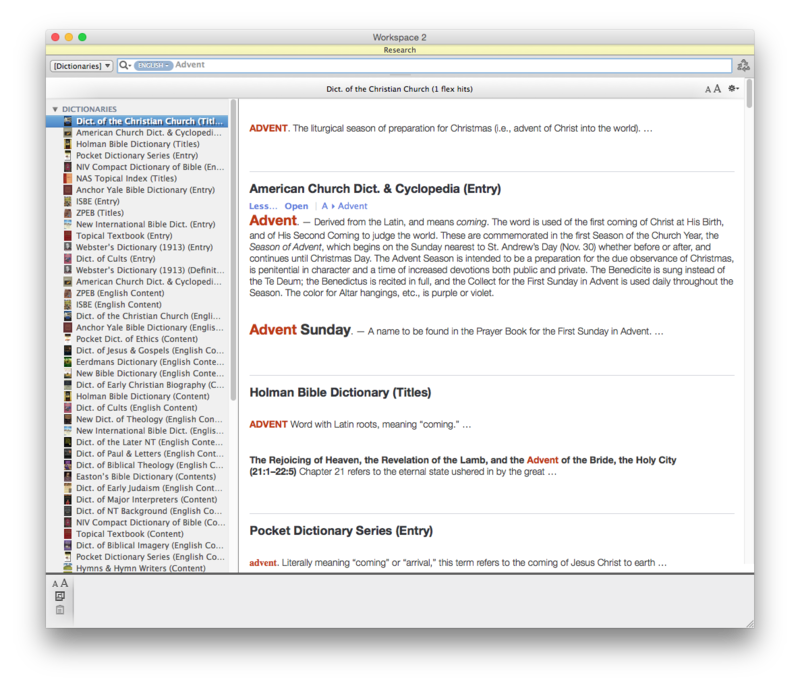 One can toggle between searching a Bible by Words or Verses. But here I get both options suggested at once, just by typing in the letter “G.” I can then select an option from the drop-down menu, which narrows if I type additional letters. This is a good refinement to the program. This easier organization also greatly enables what has recently become my most used new feature in Accordance 11…. Search All (Accordance 10) was fine, but Research (Accordance 11) is even better. At first I thought the new Research was just pretty cool, but it’s much more advanced than Search All, well-executed, and easy to navigate. I find myself using it much more than I used Search All in version 10. How does it tie in to the newly organized Library? From that drop-down menu that gave me “Dictionaries,” I can hone my search in on any category of tools in the library–Grammars, Commentaries, Greek Lexicons, etc. 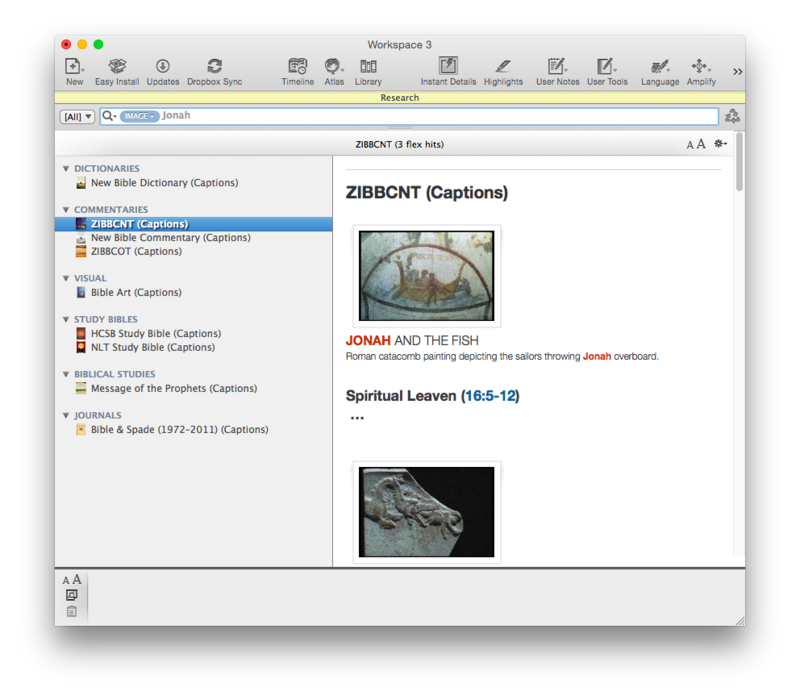 Accordance 11 offers some improvements to User Notes, not the least of which is that users can at last take notes on commentaries, books, and other non-biblical resources they own. You can do this in Kindle, iBooks, Logos, etc., so I’m glad Accordance is caught up here. This has been a long-requested user request, so will be a much-appreciated addition. You can make a single note file that is notes on one book, or you can make a note file that includes notes on multiple books you own. There is also now full Unicode support for Notes. Okay, this is definitely not a new feature, but it’s so much a part of what makes Accordance Accordance that I am compelled to mention it. Even running Research queries returns results before you can even think to navigate away to Firefox and check your email. Once again Accordance has added new features without sacrificing their trademark speed. The iOS version of Accordance allows the syncing and editing of User Notes, but does not allow the preservation of formatting styles therein. The iOS app also does not permit editing of User Tools at all. Accordance has noted that both are forthcoming in future updates, which I’ll be happy to see. The lack of ability to edit User Tools on iOS however, has led me to begin to use Evernote in place of Accordance on iPad, since Evernote edits and syncs automatically across multiple devices. This is not a criticism of Accordance 11 per se (i.e., the desktop app), but it does affect the overall Accordance user experience. The installation screens in Accordance 11 hint that a 2.0 iOS app is not too far off. The “Auto Link” button was an addition in a later version of Accordance 10. That’s one thing Evernote can’t do; any verse references in notes you write are automatically hyperlinked to the version of your choice. Accordance has hinted more is on the horizon. In the meantime, I’ve become reliant on with Evernote for sermon preparation and note-taking. Given that Logos has had both a Passage Guide and Exegetical Guide since at least Logos 4, Accordance’s Info Pane feels a bit overdue. Similarly, BibleWorks’s Resource Summary Window (bottom left pane here) quickly links to grammars, lexicons, and other verse-by-verse references. At the time of this review, the Info Pane does not have a Grammars section or Lexicons section or (what would be really fun) a Diagrams section. The improvements in Library organization and the Research feature make it really easy to get to words in multiple lexicons at once, so this is not a huge critique, but a more robust Info Pane would be great. Knowing Accordance’s responsiveness to user requests, I expect the Info Pane will grow and expand over time. I have a contact form at Words on the Word. (Feel free to drop me a line.) Easily the most common inquiry I receive is folks asking things like, “Which is better: Accordance or Logos or BibleWorks?” or, “How can I do x in Accordance?” This post is not a comparative review (this one is). So I won’t answer that question in those terms here. But I will say that the speed of Accordance and its search capabilities are hard to beat. Bibleworks is just as fast and can also run complex queries, but Accordance has more biblical studies resources, and just as many (or more) original language resources, not to mention the most customizable workspace setup of any software program (Bible or otherwise) I can think of. You gathered from the above that I like Evernote–though I also find myself wishing I could set up my workflow in it as flexibly as I can in Accordance. Thinking about diving in? Check out all the Accordance collections here. If you’re already using Accordance and wondering about the upgrade to 11, it’s a no-brainer. Go for it. It’s quite affordable for all the features you’ll get. The upgrade costs $59.90 ($49.90 if you have Accordance 10). And don’t forget about potential discounts you may qualify for. Accordance has quite a few sources of support, too. Check out their blog for more features and tips and tricks in Accordance 11. All their sources of support (a video podcast, user forums, online seminars, and more) are here. 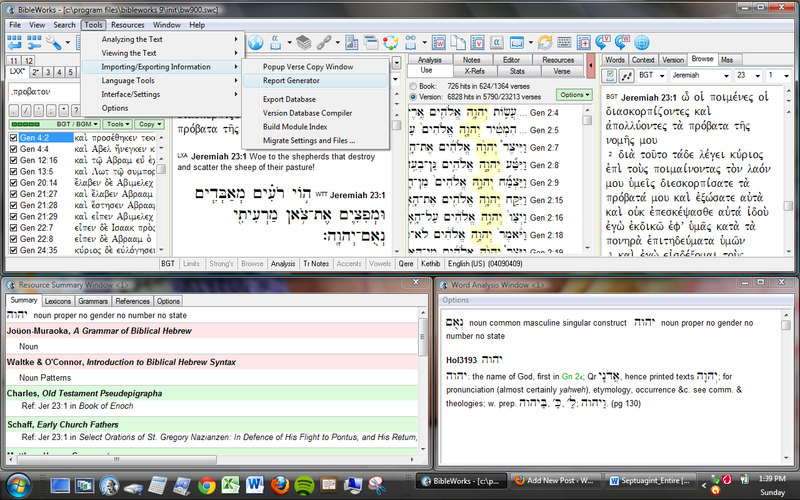 Accordance 11 is one of the apps I use almost every day. 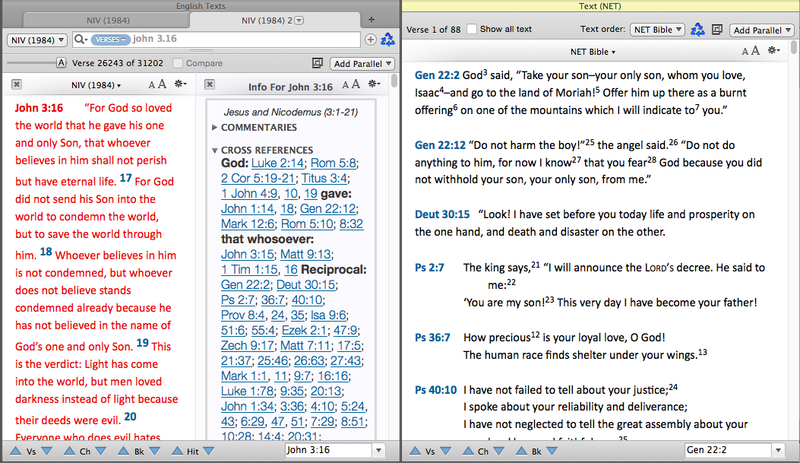 Accordance 10 was already good enough to be my first stop in Bible software. Version 11 has taken several significant steps forward that make it even more enjoyable and efficient to use. Thanks to Accordance for the review license to Accordance 11. See my other Accordance posts (there are many) gathered here. Hi, Theodore–great point! I hadn’t tried it with DSS, but I can see how it would be especially useful there. just curious… which bible software do you use most often? Quick question – I am a long time Logos user and after years of use and upgrades find its learning curve tough. However Logos has such a wonderful “Copy and Paste” box where you can type in any number of references and with one click, copy them into Word. I use this all the time. Does Accordance 11 have that? Hi, John, and thanks for the comment. I’m not sure I fully understand your question, but I think the answer is yes–you can export a lot of search result information from Accordance to Word very easily (a list of verse references, for example).